Eggs, cream and vanilla bean. Freezer-made low carb ice cream, while not as spectacular as cream from a machine, is irresistibly delicious (and has hidden benefits). Add healthier fats and meet your macros with keto ice cream protein shakes, smoothies, milkshakes and creamsicles. Store-made low carb creams are an option when pinched for time. However, these ice creams are fluffed with air and cost more per ounce on average than home made. Home-made keto ice cream gives you full control over the ingredients. This is especially important when watching macros closely or avoiding certain food groups. There are recipe variations for vanilla bean, chocolate, lemon and raspberry. These low carb ice cream recipes are great to use for popsicles, milk shakes and protein smoothies (just add your favorite zero carb protein powder). These recipes use packets of Splenda (solely for ease), but substituting liquid de-bittered Stevia is healthier (all-natural), and decreases the net carbs (it’s zero carb). The trick to making perfect ice cream every time is to take it out of the freezer 30 to 40 minutes before you serve it. Allow the ice cream to soften. Beat it briefly with a sturdy, small balloon whisk and return to the freezer until serving time. 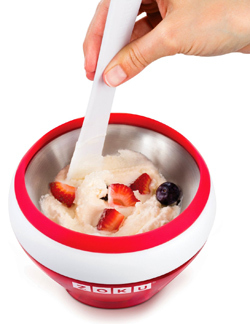 Zoku’s Instant Ice Cream Maker makes fresh, soft-serve keto ice cream in 10 minutes, hard ice cream in 20 – on your counter top. This low carb ice cream keeps fairly well in the freezer for a month or so. Press a layer of plastic wrap or parchment paper right against the ice cream, sealing it from air. Store in an air-tight to avoid a change in taste. Bump up the protein (using protein powder), add special healthy fats (like coconut oil or MCT oil), and use De-Bittered Stevia instead of Splenda or sucralose. Nature’s Best protein powder is available in 19 flavored varieties. The unflavored variety is zero carb. Pure 100% whey protein isolate, free of fat, carbs, fillers, sugars, gluten and lactose. Coconut oil can last up to two years without spoiling, and is one of the healthiest choices for cooking and baking. This classic vanilla ice cream recipe includes four variations of flavors, including creamsicles and milk shakes. Slowly heat 1 cup of heavy cream, Splenda (or equiv) and vanilla extract in the top part of a double boiler over hot, but not boiling water. Stir or whisk occasionally. Put the egg yolks in a heavy glass jar and beat until smooth. As the cream begins to heat, dribble a small amount (about 1 tablespoon at a time) into the yolks, constantly beating the yolks. Repeat this with about half the cream. Add the egg yolks and cream to the double boiler. Whisk mixture constantly until it thickens and coats a spoon (about one minute). Remove double boiler from the heat. Whisk in the remaining 1/2 cup cold light cream and 1/2 cup water. Put the custard in a covered bowl and refrigerate for at least two hours. Follow the Classic Vanilla recipe, adding 3 ounces of unsweetened chocolate to the custard while stirring in the double boiler, but before the egg yolks are added. Increase the packets of Splenda (or equiv) to 18, or to taste. 3 tablespoons (18 grams) unsweetened natural cocoa powder plus 1 tablespoon (17 grams) unsalted butter. Follow the Classic Vanilla recipe, but reduce water to 1/4 cup. Stir 1/4 cup lemon juice into the custard when you take it off the heat. Increase the packets of Splenda (or equiv) to 18. This recipe also works using lime zest or juice in place of lemon. Follow the Classic Vanilla recipe, adding 1 1/2 cups of fresh raspberries. Put the berries in a blender or food processor and crush them into a smooth puree, or leave them chunky. Increase the Splenda (or equiv) to taste. These recipe variations have slightly more net carbs. Serving sizes may be adjusted or halved to meet your macros. Turn your keto ice cream into creamy popsicles by pouring into pop molds or small containers. Simply substitute 2 1/2 cups of half-and-half for the combined cream and water. This makes an “icy” -er type of pop that holds together very well on a stick. Add chunks of fruit, nuts, berries or dark chocolate for flavor and color. Be sure to add the extra carbs to your total. If you’re into sugar-free Jello products, add any flavor/variety, to taste. Present your treats in unique containers. Low carb means no cones, but you have better options. Scoop low carb ice cream or sherbet into hollowed-out orange, lemon or lime halves. Try ceramic cups that look exactly like cones (above). BPA/PVC-free plastic ice cream cones from Spielstabil are easy to use. Lightweight, and stacks for storage or travel. Plastic mini storage containers and ice pop molds hold perfect, single servings for any flavor of keto ice cream.